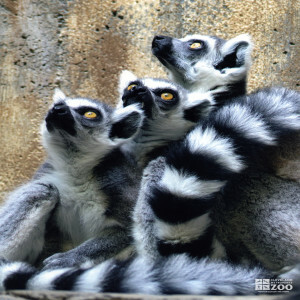 The ring-tailed lemur has a head and body length of 15 to 18 inches and a tail length of 21 to 25 inches. Their weight can range up to 6 lbs. This is the most common of the lemur family. They have black rings around their otherwise gray tail, hence the name. The body is gray with the undercoat lighter and the extremities white. There are black rings around the eyes, and the muzzle is black. Lemur catta have nonacute “nocturnal” eyes, with blue-yellow but not red-green color vision. They are committed to diurnal life. They move at night only in bright mooonlight, and habitually range out of the forest into the glaring sunlight. The range of the ring-tailed lemur is southeast and southwest Madagascar. Ring-tailed lemurs inhabit rocky mountains and deciduous forests. Gestation lasts 132 to 143 days. Ring-tailed lemurs are very gregarious animals, and it is interesting to note that in a group of lemurs the males must be in the majority to ensure a healthy social and reproductive environment. However, the troop is headed by one or more females, making it a matriarchal society. Adult females are 100% dominant over males. Males are inhibited from attacking females, whereas females supplant, cuff, or chase males with impunity. A viable troop consists of 3 to 4 males, 1 or 2 females, and the young. When a ring-tailed lemur eats juicy food it bites off pieces with the molars, so that the juice runs directly into the mouth and does not wet the fur. They are fastidiously clean and groom constantly, using grooming digits on the hind feet. These animals possess a hairless glandular region on the inside of each lower arm above the wrist. Males have an additional gland on the upper arm which secretes a strong-smelling fluid. Every foreign object in the lemur’s territory or cage is marked with this glandular secretion. Ring-tails jump quite effortlessly, even vertically up 10-foot walls. During sleep they curl up, burying their heads and arms between their legs, and wrapping the long tail around the body vertically. They can make soft purring sounds or piercing screams. In ring-tailed lemurs, the young are cared for by the mother, but all the troop members will play with and help care for the infant. In the wild most births occur in August and September. Maturity is reached in from 2 to 5 years. Females usually have multiple mates, though there is a priority of conception for the first male to mate.